Once again, we're holding our Annual Fundraiser on Thursday, September 13 at M1-5 Lounge in Lower Manhattan. If you purchase your tickets before August 17, they will be $55 a piece. After the 17th, they will increase to $65. 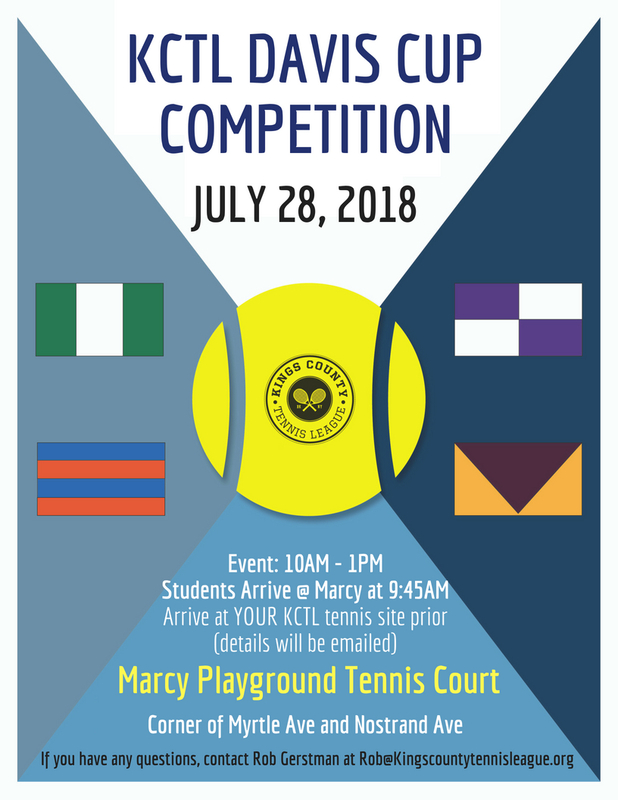 On Saturday, July 28, KCTL is hosting the annual Davis Cup Tennis Tournament! This will be a team-based, doubles tournament featuring all five KCTL sites: Marcy, Lafayette Gardens, Tompkins, Sumner, and Jackie Robinson. Following the event, KCTL is hosting a happy hour for volunteers to celebrate the conclusion of the tournament! Come to Brooklyn Tap House after the tournament to meet and socialize with your fellow volunteers! If you are a volunteer, you can register for the social by clicking here. KCTL has a new tee shirt design! See our store to grab one! KCTL is excited to announce the formation of our first Family Committee! This committee meets monthly to plan engaging activities, help attract more volunteers from the community, and much, much more! Throughout the summer, we will be enriching our female students with an all girls tennis and education class that will enable many girls to participate in tennis and life-skills lessons. Our goal is to increase female participation throughout our programming by engaging and empowering our female students. Our new Pee Wee Tennis Program is off to an excellent start! Formed through a partnership with Brooklyn Kindergarten Society, this new program offers four-year old BKS students at Sumner and Tompkins tennis classes midweek. The program lasts until November 1, 2018. If you are available to volunteer, please click the button below.